PM 2.5 stands for Particulate Matter 2.5. The term ‘particulate matter’, or term fine particles, refers to tiny particles or a very tiny speck. From the name, PM 2.5, the 2.5 indicates that the diameter of this microscopic particle is 2.5 micrometers or smaller. These particles can only be seen by an electron microscope. These fine particles are produced from combustion, often including motor vehicles, burned wood, fires, and industrial processes. PM 2.5 cannot be filtered out by masks, or organs in the human body and can cause many health problems. The width of a human hair is about 50 to 70 microns in diameter. A grain of beach sand is approximately 90 microns in diameter. 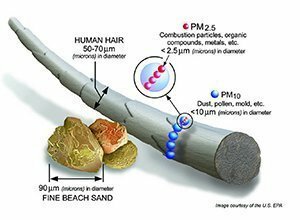 PM 10, a particle that has a diameter of 10 microns, is about the size of mold, dust, and pollen. However, compared with all these sizes, PM 2.5 is still the smallest. It is only a whopping 2.5 microns in diameter, which is the size of combustion particles, organic compounds and metal elements, etc. People who have heart or lung diseases, the elderly, and children are more likely to be affected by particle pollution exposure. If you are healthy, you may experience some temporary symptoms like irritation of eyes, nose, and throat, coughing, difficulty breathing. It may also contribute to heart attacks, asthma attacks, and premature death in people with heart or lung disease. Particle pollution can create haze, which looks like fog, and reduces visibility. Also, it may create stains and damage buildings or statues. This also increases acidity in waters or change the flow of nutrients. Finally, it can deplete the soil and damage forests and national parks. 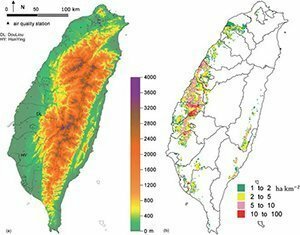 PM 2.5 and other sorts of particle pollution can cause a lot of damage to our health, but how can we know when the air pollution is bad and when we should stay indoors? Fortunately, there are maps, like the one located above, that can show you where the pollution is bad. In addition, you can always look up on the internet to see which days you should try to avoid going outdoors.